Background Cancers are one of the leading causes of death in the world and, due to the aging population, incidence rates are set to rise. As such, considerable effort has been placed on initiatives that aid the early detection of cancer, as this may improve patient survival outcome. One such initiative is the development of guidelines that explain how and when patient reported alarm symptoms suggestive of an underlying malignancy should be referred to a specialist. However, despite being conveniently placed to deliver interventions to promote the early detection of cancer, it is not clear what role community pharmacists could have in the development and implementation of these guidelines. 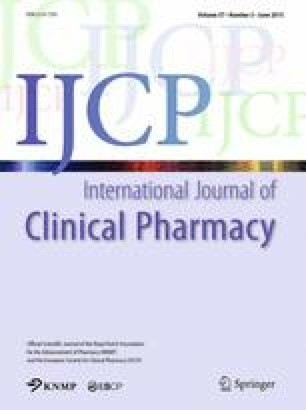 Objective To: (1) assess the frequency and mean of patient reported alarm symptoms in a community pharmacy setting; (2) determine the demographics of patients presenting with the alarm symptom; and (3) explore the relationship between deprivation index of the community pharmacy and average frequency of alarm symptoms per pharmacy. Setting Thirty-three community pharmacies in the North of England. Method A prospective study from September 2013 to February 2014. Each community pharmacy team was provided training in relation to alarm symptoms to ensure there was consistency in reporting. Deprivation tertiles for each community pharmacy were calculated using the IMD 2010 deprivation index. The data were analysed using a Kruskal–Wallis test in order to determine whether there were any statistically significant associations between average frequency of alarm symptoms presented per pharmacy and the deprivation tertile. Main outcome measure Frequency of patient reported alarm symptoms. Cancer Factsheet. The World Health Organisation. 2014. http://www.who.int/mediacentre/factsheets/fs297/en/. Accessed 16 Oct 2014. Boyle P, Levin B. World Cancer Report 2008. Lyon: The World Health Organisation. 2008. http://www.iarc.fr/en/publications/pdfs-online/wcr/2008/. Accessed 16 Oct 2014. Stewart BW, Kleihues P. World Cancer Report. Lyon: The World Health Organization. 2003. http://www.iarc.fr/en/publications/pdfs-online/wcr/2003/. Accessed 16 Oct 2014. Cancer Research UK. Cancer incidence in the UK in 2011. London: Cancer Research UK. 2014. http://www.cancerresearchuk.org/cancer-info/cancerstats/incidence/uk-cancer-incidence-statistics. Accessed 16 Oct 2014. National Institute for Health and Clinical Excellence. Referral guidelines for suspected cancer. 2005. http://www.nice.org.uk/nicemedia/pdf/CG027quickrefguide.pdf. Accessed 28 June 2014. Information Services Division Scotland (ISD). Cancer statistics: cancer of the oesophagus. 2014. http://www.isdscotland.org/Health-Topics/Cancer/Cancer-Statistics/Oesophagal/. Accessed 28 June 2014. Department of Health. 2014. Be clear on cancer campaign. http://campaigns.dh.gov.uk/category/beclearoncancer/. Accessed 28 June 2014. NHS Scotland. Better health, better care: action plan. Edinburgh: The Scottish Government. 2008. http://www.scotland.gov.uk/Resource/Doc/210642/0055693.pdf. Accessed 28 June 2014. Community Pharmacy Contractual Framework. http://psnc.org.uk/contract-it/the-pharmacy-contract/. Accessed 16 Oct 2014. Department for Communities and Local Government. The english indices of deprivation. 2010. London: Crown Copyright; 2011. https://www.gov.uk/government/publications/english-indices-of-deprivation-2010. Accessed 28 June 2014. Rural and Urban Area Definition for Lower Layer Super Output Areas. http://www.ons.gov.uk/ons/guide-method/geography/products/area-classifications/rural-urban-definition-and-la/rural-urban-definition—england-and-wales-/index.html. Accessed 16 Oct 2014. Office for National Statistics. Ethnicity and national identity in England and Wales 2011. http://www.ons.gov.uk/ons/dcp171776_290558.pdf. Accessed 16 Oct 2014. National Cancer Intelligence Network (NCIN). Public Health England. Routes to diagnosis: exploring emergency presentations. 2014. http://www.ncin.org.uk/publications/data_briefings/routes_to_diagnosis_exploring_emergency_presentations. Accessed 16 Oct 2014.